Color Me Katie: Snow Day! Last night while sleeping we were hit with a giant snowstorm! Can I call this a snow day? I wouldn't want to slip on some ice on the way to my computer! Excellent photos. 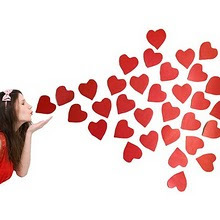 I wish love and success. neato! these are beautiful! i love your winter wonderland! You should totally take a snow day! Can I ask a question? What kind of paper do you use for cutting out all the cool shapes you use? I would love to do something fun in my son's room but construction paper fades too quickly and the colors don't seem as vibrant as the paper you are using. I love all of your ideas - so whimsical! Beutifull snow my friend!! see you!! How CUTE@!! I love this :) Thanks for sharing your beautiful creations! How does your cat not rip all that down? He must be a great cat! Love it! ei,wanna share some instructions on how to do that?would really like do to that in my sons bedroom...thanks! you are just too cute and colorful. I have been turning my room into a winder wonderland and hanging snowflakes everywhere but it is No comparison to THIS! I want my room to look like this!! I covered my apartment in snowflakes last week two! it put me right into the mood and it was soooo addictive. I love how they are all different and unique. This is oh so lovely! Come do this to my house?? 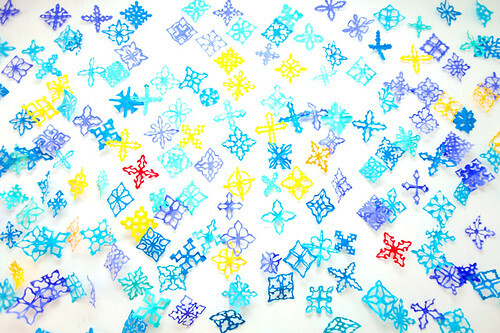 please share how you made such pretty flakes! 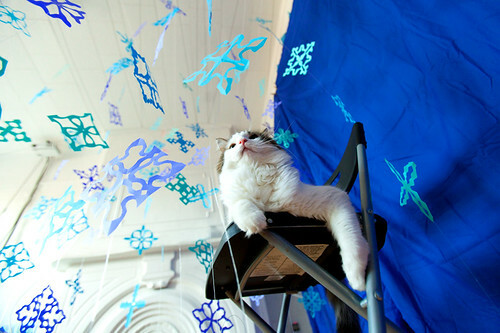 I always try to cut up some snow flakes round this time of year, but they never turn out right! Have and tips or tricks for me? Oh please teach us how you did it!? i wanna call a snow day too! seriously If I could have just ONE wish in life it would be to be you for a day. oh, pretty puh-lease share with us your patterns/design instructiosn for cutting those out! I wanna learn how to make them in such pretty shapes. It's so funny how you make this all! Wonderful Katie. omgee! this is so so so pretty! :) how did u make them? So fun! did you cut those yourself? @Alexis- Yep! I cut them at night while watching movies. It's pretty relaxing! To everyone asking how I made them- I'm not quite sure! I just folded paper in that triangle shape and just experimented with different cuts each time. LOL about not wanting to slip on the way to your computer. Your humor is by no means flakey. I'm stealing that for next year! Mark my words! It's not gonna be as awesome as yours, but I'll attempt it anyways! magical! Looks like a lot of work too. Not to detract from the "let's-live-all-out-with-flair-and-extra-happy-happy-joy-joy" that I come by here for, but all snowflakes have six points! Maybe next year we'll see a blend of science and art.